Stumped, the congressional delegation and expert panel looked at each other in silence for a few moments. Not that they didn’t clearly appreciate the question. Green was one of a few hundred people, a vast majority African-American, including her, who packed the Mural Pavilion in Harlem last Friday. They came to hear expert testimony on economic challenges facing the African-American community, submitted to members of the Congressional Joint Economic Committee and the Congressional Black Caucus. Joining two panels of experts onstage were representatives Carolyn Maloney (D-NY), ranking Democrat on the Joint Economic Committee; G.K. Butterfield (D-NC), current chairperson of the Congressional Black Caucus; Yvette Clarke (D-NY) and Hakeem Jeffries (D-NY), representing parts of Brooklyn (Clarke is also the first woman vice chair of the Congressional Black Caucus); and last but far from least, Harlem’s own Charles Rangel (D-NY), long-time congressional representative of Harlem, where he remains a larger-than-life icon. Helping to broaden the definition of that dream was at the heart of testimony from Clayton Banks, founder of Silicon Harlem, a social venture that aims to transform Harlem into a technology and innovation hub. Banks brought up access to capital for tech startups in Harlem as one of the many different barriers that Silicon Harlem is finding ways to break down. “You’ve got Harlem and Wall Street on the same island,” Banks said, quoting Jesse Jackson. The gathering was the second such forum so far related to an ongoing Joint Economic Committee conversation presented as The American Dream on Hold. The first forum took place in June in Baltimore. Future sessions will depend on other members of Congress stepping up with requests and resources to support them. The Joint Economic Committee started out with a report that gathered data on the economic challenges facing the African-American community. “Having good data is critical to getting the pieces in shape to bring change,” Maloney said in her opening statement on Friday. The immense wealth disparity between white and black families was something that Maloney noted as something that strikes her most deeply. 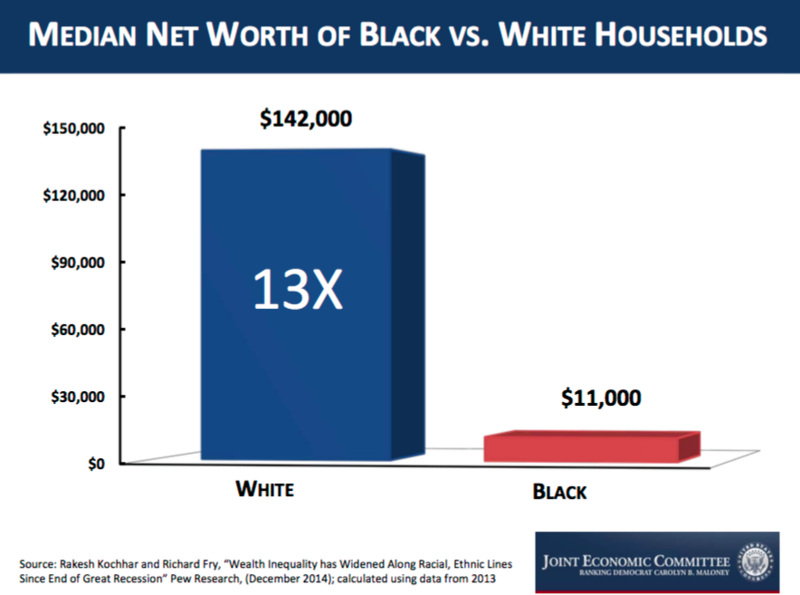 Citing U.S. Census Bureau data from 2013, the Joint Economic Committee report notes that the median net worth of white households is 13 times that of black households. “It’s impossible to see these numbers and not understand the scope of these challenges,” Maloney said. Duke University Professor William “Sandy” Darity Jr. was one of the experts who delivered testimony to the delegation. Duke University is in Butterfield’s congressional district. “While the persistence of employment discrimination constitutes a critical barrier to black economic well-being, the most important barrier is associated with a racial wealth gap,” Darity’s official testimony reads. The meat of Darity’s testimony to the congressional delegation centered on data uncovered at Duke University’s Samuel DuBois Cook Center on Social Equity, where Darity is director. Blacks who were unemployed in 2011 had zero family net worth, Darity said, whereas whites who were unemployed in 2011 had an average family net worth of $21,892 (nearly twice as high as the average family net worth for blacks working full-time). The most striking statistic he found was that blacks with a college degree have $10,000 less in median wealth than whites who did not finish high school. Darity rounded out his testimony with a call for three policy changes. First, a program of reparations that would provide compensation not only for slavery but for 100 years of Jim Crow practices and ongoing racism and discrimination. Second, a program that would guarantee employment for all Americans on par with the Works Progress Administration during the Great Depression. And third, a program that would provide each newborn infant a government trust fund or endowment with an amount depending on the wealth position of their family, which they could access upon reaching adulthood. To make sure those policy changes have a chance, the crowd and the testifying experts seemed to agree, a return to political fervor is essential.